The broadcast network evening newscasts on Wednesday night all marked Barack Obama's victory with stories on celebrations around the world, the joy expressed by African-Americans and how newspapers sold out as people cheered in the streets. NBC anchor Brian Williams hailed: "As one columnist put it, America matured in 2008 by choosing Barack Obama." CBS, however, aired the most triumphant story. Though Ronald Reagan earned nearly 59 percent of the vote in 1984 and George Bush captured more than 53 percent four years later, an awed Byron Pitts began by proposing about Obama's win with 52 percent: "When was the last time our nation cheered this much?" Pitts proceeded to cite anecdotes about several people, black and white, who saw vindication in Obama's victory, including two women at "a suburban home in Iowa. Iowa, the state that first bought into Obama's audacious hopes and where a life-long Democrat like Deb Tekippe and a life long Republican like Brenda Myer made a toast with champagne." He concluded: ""We the people of the United States, in order to form a more perfect union." That's what the Constitution says. Last night, all across America for so many people, that's how it felt. A more perfect union." Examining "what went wrong" with John McCain's campaign, ABC's David Wright charged Wednesday night that by asserting Barack Obama would "be redistributionist in chief" McCain had "distorted Obama's policy positions" (how that was a distortion Wright did not say) and painted McCain as a hypocrite for having "mocked Obama as an empty-headed celebrity" before "he created a celebrity of his own," Sarah Palin. While "many were impressed" with her, Wright snidely contended "plenty of others came to see Sarah Palin as an empty designer suit." In castigating McCain from the left, Wright failed to offer any conservative critiques, such as McCain's lack of consistent conservative positions to contrast himself with Obama. "If Barack Obama was driving the Cadillac of campaigns," World News anchor Charles Gibson quipped, "John McCain was driving one that seemed in constant need of a tune-up and by the end it simply ran out of gas." Good Morning America reporter Bill Weir gushed on Wednesday morning about the "transcendent" reaction to Senator Barack Obama's presidential victory. Discussing Tuesday night's jubilant crowds in New York City, where the ABC program is produced, Weir described the "melting pot of communal joy." Weir enthused that the celebration was "the kind not seen on New Year's Eve or championship parades. At the crossroads of the world, voices from around the world shouted of the greatness of America." He added: "When the announcement was made, literal dancing in the streets...And people were locking in embraces, watching the speech there as well." The co-hosts of Wednesday's CBS Early Show used as many glowing adjectives as they could think of in reporting Barack Obama's election to the presidency, with Harry Smith leading the way: "America votes for change. Barack Obama elected the 44th President of the United States after a decisive victory over John McCain. The nation opens a new era, a powerful moment in history." Maggie Rodriguez described what it was like to be at Obama's victory speech in Chicago: "I have to say that to be here last night for that moment was to live history, it was a privilege...the sea of waving American flags and feeling the euphoria and the emotion that was emanating from that crowd here last night...a chilling victory speech, it -- it left people here just speechless, it was breath-taking." Good Morning America foreign correspondent Jim Sciutto rhapsodized about international reaction to Barack Obama's victory on Wednesday and described the President-elect as "the winner who's capturing the world's heart." Sciutto described much of the foreign response with the phrase "only in America." Then, taking a shot at President Bush, he added: "That's what we keep hearing in so many places around the world, a sense that Barack Obama embodies the American dream, a dream that, frankly, has been tarnished overseas in recent years by a very unpopular war in Iraq, a very unpopular president in President Bush." After highlighting the joyous reaction around the world, Sciutto summed the glowing critique up by reading an e-mail from an Italian woman received in ABC's Rome bureau. He recited, "Dear friends, your country has renewed faith that all is possible. Welcome back, American dream." The broadcast network evening newscasts on Wednesday night all marked Barack Obama's victory with stories on celebrations around the world, the joy expressed by African-Americans and how newspapers sold out as people cheered in the streets. NBC anchor Brian Williams hailed: "As one columnist put it, America matured in 2008 by choosing Barack Obama." CBS, however, aired the most triumphant story. Though Ronald Reagan earned nearly 59 percent of the vote in 1984 and George Bush captured more than 53 percent four years later, an awed Byron Pitts began by proposing about Obama's win with 52 percent: "When was the last time our nation cheered this much?" Pitts proceeded to cite anecdotes about several people, black and white, who saw vindication in Obama's victory, including two women at "a suburban home in Iowa. Iowa, the state that first bought into Obama's audacious hopes and where a life-long Democrat like Deb Tekippe and a life long Republican like Brenda Myer made a toast with champagne." He concluded: ""We the people of the United States, in order to form a more perfect union." That's what the Constitution says. Last night, all across America for so many people, that's how it felt. A more perfect union." On the NBC Nightly News, Williams set up a story on general public reaction, as opposed to a separate piece on black reaction: "This nation woke up this morning changed. As one columnist put it, America matured in 2008 by choosing Barack Obama. Tonight, NBC's Kevin Tibbles takes stock of a new day." Over on ABC's World News, anchor Charles Gibson introduced a story: "In many cities all across the country last night, it was as if the local team had won the World Series or the Super Bowl. 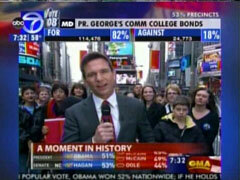 Barack Obama supporters danced in the streets, wept, halted traffic, and lifted their voices in prayer." KATIE COURIC: The celebrations we saw overnight were like none we had ever seen. In many towns in America it was as if they just won the World Series. But then the country has never seen an election like this one. 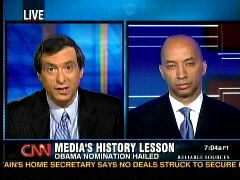 Here's our national correspondent, Byron Pitts. MAN SELLING NEWSPAPERS: Obama won! BARACK OBAMA: It's been a long time coming. PITTS: -our nation cheered this much? PITTS: Wept this long? From a park in Chicago, a church basement in Cleveland, a church where the pastor's own distant cousin was shot and killed for simply trying to vote in 1930. PASTOR: It sends chills up my spine. PITTS: To Ann Nixon-Cooper's living room. President-elect Obama called her by name. ANN NIXON-COOPER: I stayed up to listen for it. OBAMA: Ann Nixon-Cooper is 106 years old. PITTS: -and where a life-long Democrat like Deb Tekippe and a life long Republican like Brenda Myer made a toast with champagne. DEB TEKIPPE: I just think it just kind of shows what Brenda and I have gone through the same way the country has gone through. The fact that we can have our differences, we can discuss them and we can come together with a common goal. PITTS: For Barack Obama, that goal started with a speech near the very same steps where Lincoln once spoke. BARACK OBAMA: I stand before you today to announce my candidacy for President of the United States of America! PITTS: Just words that energized so many, made use of so much. INTERNET VIDEOS: Yes, we can. Yes, we can. PITTS: Yes, the road had its moments. OBAMA DURING PRIMARY DEBATE: I was fighting these fights. HILLARY CLINTON: I have so many opportunities from this country. PITTS: Old demons and new ones. What Barack Obama started actually began long ago. Out of the huts of history's shame, the poet wrote, a history reflected upon inside Atlanta's historic Ebenezer Baptist church last night, the church where Dr. King once preached of dreams. Dreams his long-time friend, Reverend Joseph Lowery, finally saw come true. REVEREND JOSEPH LOWERY: The minute t the card clicked out of the voting machine it dawned on me I had just voted for an African American for President, for the 44th President of the United States. And I froze and out of my mouth came "Hallelujah." PITTS: That history was on the minds of millions of Americans last night. People like Sondra Hollinger Samuels of Minnesota. We first met her at the Democratic convention this summer, the night Obama's name was put into nomination. Then and now, she remembered what her father might say. SONDRA HOLLINGER SAMUELS: He would say "God almighty, I can't believe it!" I mean, he would, he would be so, he would be so proud. PITTS: Her father is actually still alive. At 72, Alzheimers is stealing away Richard Hollinger's mind and his memories. But not ours, not his daughter's. SAMUELS: It's more than I ever thought that it could be, you know? I mean, the words in our Constitution are coming to life in a real tangible way. Examining "what went wrong" with John McCain's campaign, ABC's David Wright charged Wednesday night that by asserting Barack Obama would "be redistributionist in chief" McCain had "distorted Obama's policy positions" (how that was a distortion Wright did not say) and painted McCain as a hypocrite for having "mocked Obama as an empty-headed celebrity" before "he created a celebrity of his own," Sarah Palin. While "many were impressed" with her, Wright snidely contended "plenty of others came to see Sarah Palin as an empty designer suit." In castigating McCain from the left, Wright failed to offer any conservative critiques, such as McCain's lack of consistent conservative positions to contrast himself with Obama. "If Barack Obama was driving the Cadillac of campaigns," World News anchor Charles Gibson quipped, "John McCain was driving one that seemed in constant need of a tune-up and by the end it simply ran out of gas." Wright fretted that after McCain won the GOP nomination "he started to change" and cut off media access, as if that led to his defeat: "The free-wheeling exchanges that put the Straight Talk Express on the map didn't last past the maiden voyage of Straight Talk Air." Wright pointed out how "McCain had always promised to run a clean campaign on the issues," but soon, Wright scolded, "McCain attacked Obama's associations....Obama's experience....and distorted Obama's policy positions." CHARLES GIBSON: If Barack Obama was driving the Cadillac of campaigns, John McCain was driving one that seemed in constant need of a tune-up and by the end it simply ran out of gas. David Wright is in Phoenix. David. DAVID WRIGHT: Good evening, Charlie. This was always shaping up to be a tough year for Republicans, but many people thought if anybody could pull it off it'd be John McCain. A brand name people could trust, a straight-talking maverick. But then it kind of seemed like a different candidate turned up for the general election. John McCain's message from the start was all about being his own man. McCAIN: There's nobody that can stand between me and you. There's nobody who can stop and filter my message to you. WRIGHT: In the primaries, the old straight-talking John McCain dispatched of Mitt Romney by exposing him as a flip-flopper. McCAIN DURING A DEBATE: We disagree on a lot of issues, but I agree you are the candidate of change. WRIGHT: -he started to change. The free-wheeling exchanges that put the Straight Talk Express on the map didn't last past the maiden voyage of Straight Talk Air. McCain had always promised to run a clean campaign on the issues. McCAIN: A lot of the stuff that you see that you don't like will not happen in this campaign. WRIGHT: And when that failed to close the gap, he took different advice. RICH GALEN, REPUBLICAN STRATEGIST: Sometimes you have to take mother's picture and turn it towards the wall and just go after the other guy. 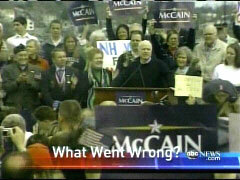 WRIGHT: McCain attacked Obama's associations. McCAIN: I've been tested, my friends, Senator Obama hasn't. WRIGHT: And distorted Obama's policy positions. McCAIN: Senator Obama's running to be redistributionist in chief. WRIGHT: Last summer, McCain mocked Obama as an empty-headed celebrity. NARRATOR IN PARIS HILTON AD: He's the biggest celebrity in the world. WRIGHT: But then he created a celebrity of his own. McCAIN: When you get to know her, you're going to be as impressed as I am. WRIGHT: Many were impressed, but plenty of others came to see Sarah Palin as an empty designer suit. MATTHEW DOWD: He picked somebody that ultimately is viewed as unqualified that looks to the public like here's a guy that's doing things for political expediency. SARAH PALIN: If I cost John McCain even one vote I am sorry about that because John McCain I believe is the American hero. WRIGHT: But even if everything else had gone according to plan. 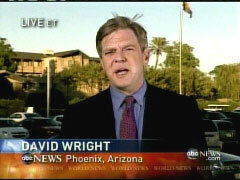 WRIGHT: McCain never planned on the financial meltdown. McCAIN: Tomorrow morning, I'll suspend my campaign and return to Washington. WRIGHT: As the stock market plunged, McCain's fortunes did too. WRIGHT: But perhaps most damaging of all, that gave Barack Obama an opening to argue that John McCain wasn't his own man after all, that he represented four more years of the same. Charlie. Good Morning America reporter Bill Weir gushed on Wednesday morning about the "transcendent" reaction to Senator Barack Obama's presidential victory. Discussing Tuesday night's jubilant crowds in New York City, where the ABC program is produced, Weir described the "melting pot of communal joy." Weir enthused that the celebration was "the kind not seen on New Year's Eve or championship parades. At the crossroads of the world, voices from around the world shouted of the greatness of America." He added: "When the announcement was made, literal dancing in the streets...And people were locking in embraces, watching the speech there as well." The journalist even recounted how he attempted to remind an African American mother of America's history with slavery. After this woman and her daughter saw a graphic on a jumbotron of all the presidents, one that included Obama as the nation's 44th commander in chief, Weir went over to the pair and attempted to invoke a negative reaction. He explained: "And I leaned over and said, you know, 12 of those men owned slaves. And the mother turned to me and said, 'That stain is washed.'" SAWYER: But, first, lets get more of a sense of what was going on in America's streets and across the nation as Americans came out in millions to mark the historic election. Joining us now with all the highlights from across the country, GMA weekend anchor Bill Weir. Bill? BILL WEIR: Diane, as you know so well, when you work here in the crossroads of the world, you get used to group jubilation in various forms. But last night was transcendent. It was something else entirely. But, this was the site of just one party. For Barack Obama supporters last night, the center of the universe was Chicago. He drew six-figure crowds on the campaign trail. So, it was hardly shocking when 150,000 packed Grant Park, in Obama's hometown of Chicago. All of them, a little less nervous, a little more hopeful, with every state called, until about 10:00 local time, when history was announced. CHARLIE GIBSON: Barack Obama will be the 44th president of the United States. WEIR: And tears began to flow. At Shiloh church, in the nation's capital, An explosion of emotion. It spilled down Pennsylvania Avenue, to the gates of the White House. UNIDENTIFIED WOMAN: We all did it! You! You! You! WEIR: And from Morehouse College in Atlanta, to Martin Luther King Boulevard in Harlem, African-Americans let fly shouts of joy and relief 200 years in the making. But 60 percent of Obama's votes came from white people in places like San Diego and Seattle. And in the heart of New York City, a melting pot of communal joy. And your thoughts on this historic moment? UNIDENTIFIED WOMAN: Oh, we are so excited. SECOND UNIDENTIFIED WOMAN: This is a day the Lord has made. WEIR: The kind not seen on New Year's Eve or championship parades. At the crossroads of the world, voices from around the world shouted of the greatness of America. And it really came in ebbs and flows. When the announcement was made, literal dancing in the streets and then, it calmed down. And people were locking in embraces, watching the speech there as well. But, the one moment, Diane, that will be forever seared in my memory. I happened to be watching an African-American mother and daughter and their knees literally buckled. And I looked up at our jumbotron, to see what caused it. And it was this graphic that you put together of the now 44 presidents of the United States. And when they recognized that image, it was- it was convulsions, sobs and laughter at the same time. And I leaned over and said, you know, 12 of those men owned slaves. And the mother turned to me and said, 'That stain is washed.' Diane? SAWYER: Oh my, Bill. Well, I wanted to put that page up, because I was always struck in high school looking at the history books when I got to that page of American presidents and they all looked so much the same. Smith later shared his own experience of crowd "euphoria": "I was actually in Times Square for a while last night, and it was amazing as the results came up on to the screen, state by state by state, the crowds erupted in various states of euphoria." Correspondent Jeff Glor continued the theme as he reported: "...we watched the results come in, we watched the crowd react... eventually as the final results came in, go from a chant of 'Yes We Can' to 'Yes We Did'...when Barack Obama got the nod, the raw emotion of the moment was too much for many Americans." Glor later observed: "Obama's victory speech was reserved, not rousing, perhaps by design, delivered by a man who prides himself on keeping cool, no matter how good or bad the news." BARACK OBAMA: Because of what we did on this day, in this election, at this defining moment, change has come to America. HARRY SMITH: America votes for change. Barack Obama elected the 44th President of the United States after a decisive victory over John McCain. The nation opens a new era, a powerful moment in history. 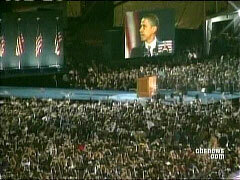 SMITH: This is the picture from Grant Park last night as more than a hundred thousand people poured out of the streets and into this place to hear the words of the President-Elect Barack Obama, who will become the 44th President of the United States. Morning everybody. Morning, Maggie. MAGGIE RODRIGUEZ: Harry, Julie, good morning to you. I have to say that to be here last night for that moment was to live history, it was a privilege. And a couple of things are etched in my mind. First of all, looking back at this empty field and remembering just the sea of waving American flags and feeling the euphoria and the emotion that was emanating from that crowd here last night. And of course, watching the president-elect, one who looks like none ever has before, deliver a chilling victory speech, it -- it left people here just speechless, it was breath-taking. And I have to say, though, that even though this night belonged to Barack Obama, Julie and Harry, I've also heard enormous respect for the way that John McCain bowed out of this, himself noting the historical significance of an Obama victory and vowing to work with him in the years to come, which was so encouraging, and I thought perfect punctuation to this historic election. JULIE CHEN: Yeah, it was so moving last night. You couldn't help but feel so emotional and I agree with you, I think John McCain did a really classy job in his speech, in acknowledging Barack's big win. And what was most inspiring to me was when Barack Obama was addressing that huge crowd out there in Chicago, was watching such a diverse group of faces, all with so much hope in their eyes. That made me feel really good. SMITH: Alright, we've got lots to do this morning, let's get right to our election -- [no audio]. This was the picture in Times Square, I was actually in Times Square for a while last night, and it was amazing as the results came up on to the screen, state by state by state, the crowds erupted in various states of euphoria. And we'll have lots to get to and a lot to talk about this morning. HARRY SMITH: Let's get to our election results. It was a record turnout, more than 130 million Americans voted and Barack Obama won the popular vote by a comfortable margin, 52% to 47%. The electoral vote turned into a landslide, 349 for Obama, 163 for McCain. Obama maintained control of the usual Democratic strongholds and won some key battleground states. Obama was the easy winner in places like Pennsylvania, surprisingly also, in Ohio. He won Nevada, Colorado, and even eked out a victory in Virginia, which has not voted Democratic in more than 40 years. Let's go back to Chicago, here's Maggie. MAGGIE RODRIGUEZ: Harry and Julie, I want to show you some local headlines from the president-elect's hometown of Chicago. From the Chicago Sun Times this morning, on the cover, a photo of Barack Obama and the words 'Mr. President.' And now from the Chicago Tribune, it is a full page shouting 'It's Obama!' and showing a photo of the crowd here reacting to the news that he had won. 150,000 people gathered inside and around Grant Park behind me, to be here to witness this historic moment. Early Show national correspondent Jeff Glor and I were among them. We sat right on this very platform, got here early in the evening and left early in the morning. JEFF GLOR: Yeah, we watched the results come in, we watched the crowd react. And we watched this crowd last night, Maggie, eventually as the final results came in, go from a chant of 'Yes We Can' to 'Yes We Did.' It was a day that was going to become a historic night, no matter which ticket won. Still, when Barack Obama got the nod, the raw emotion of the moment was too much for many Americans. BARACK OBAMA: America, we have come so far, we have seen so much, but there's so much more to do. GLOR: The president-elect took the stage in Chicago at 11 local time. OBAMA: At this defining moment, change has come to America. GLOR: Earlier in the night, got his first sizable slice of good news when Pennsylvania became the first battleground called in his favor. KATIE COURIC: CBS News now projects Barack Obama will win the battleground state of Pennsylvania. GLOR: Next, Ohio, an ominous sign, making it increasingly unlikely McCain would win. 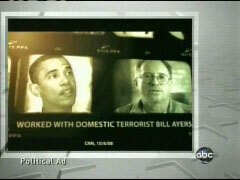 COURIC: We can now tell you that CBS News can project Barack Obama has won the state of Ohio. GLOR: While other crucial states like Indiana and North Carolina remain too close to call, the race was decided for good when the west coast weighed in and a winner was appointed. COURIC: Because of victories in California, Washington, Oregon, and Hawaii, CBS projects that Senator Barack Obama of Illinois will be the next President of the United States. GLOR: Obama's victory speech was reserved, not rousing, perhaps by design, delivered by a man who prides himself on keeping cool, no matter how good or bad the news. OBAMA: The road ahead will be long, our climb will be steep. We may not get there in one year or even one term, but America, I have never been more hopeful than I am tonight, that we will get there. I promise you, we as a people will get there. GLOR: While McCain, addressing a solemn crowd, pledged his support. JOHN MCCAIN: Tonight, more than any night, I hold in my heart nothing but love for this country and for all it's citizens. Whether they supported me or Senator Obama, I wish God's speed to the man who was my former opponent and will be my president. GLOR: From coast to coast, north to south, the nation reacted. UNIDENTIFIED WOMAN: Everyone is so excited, and so happy, and so ready for change. GLOR: And Maggie, it's worth mentioning, as you've noted off the top, as many people have noted, the grace and dignity of John McCain's speech in Arizona, really interesting to watch that as well as Obama's speech that followed. RODRIGUEZ: And the point that you made in your piece, I've heard more than one people mention that they felt Obama's speech didn't have enough excitement to fit the occasion, but you think it was absolutely by design. GLOR: I think it's in keeping with his character of he says, 'not getting too high when times are good and not getting too low when times are bad.' He realizes the challenges the country faces and I think he's ready to head right in. Good Morning America foreign correspondent Jim Sciutto rhapsodized about international reaction to Barack Obama's victory on Wednesday and described the President-elect as "the winner who's capturing the world's heart." Sciutto described much of the foreign response with the phrase "only in America." Then, taking a shot at President Bush, he added: "That's what we keep hearing in so many places around the world, a sense that Barack Obama embodies the American dream, a dream that, frankly, has been tarnished overseas in recent years by a very unpopular war in Iraq, a very unpopular president in President Bush." After highlighting the joyous reaction around the world, Sciutto summed the glowing critique up by reading an e-mail from an Italian woman received in ABC's Rome bureau. He recited, "Dear friends, your country has renewed faith that all is possible. Welcome back, American dream." Sciutto closed by asserting, "It's that kind of emotion around the world now." Co-host Robin Roberts concurred, "It's that kind of emotion, Jim." ROBIN ROBERTS: And, Diane, as many people were saying, The world was watching America last night. And you can see, a lot of international press still here today at Grant Park because all eyes were on the new president-elect of the United States of America, Barack Obama. So, what does this mean, worldwide? 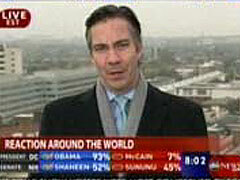 Well, our senior foreign correspondent, Jim Sciutto, he has a world's eye view from London this morning. Good morning, Jim. JIM SCIUTTO: Good morning, Robin. Only in America. That's what we keep hearing in so many places around the world, a sense that Barack Obama embodies the American dream, a dream that, frankly, has been tarnished overseas in recent years by a very unpopular war in Iraq, a very unpopular president in President Bush. But there's clearly something different, something special, even without knowing a lot about him, that many overseas people see in Barack Obama. It was an election that captured the world's attention, now, with the winner who's capturing the world's heart. SCIUTTO: There was praise from world leaders. HAMID KARZAI: I applaud the American people for their courage and for the great morality that they showed. SCIUTTO: And from average people. UNIDENTIFIED MALE: They have once again shown that and proved that the USA is the land of all possibilities. UNIDENTIFIED WOMAN: I think he'll make a better president. He's younger. He's very exciting. SCIUTTO: To U.S. soldiers on the ground in Iraq and Afghanistan. UNIDENTIFIED SOLDIER: And I feel like, it's change because it's an African-American. SCIUTTO: With Obama's international upbringing, the celebration overseas was often very personal. This was the scene at the school he attended as a child in Indonesia. SECOND UNIDENTIFIED MALE: I'm speechless. I'm very grateful. Thank God for him that finally he reached- achieved what he's been seeking all this time. SCIUTTO: And nowhere was it more emotional than in his father's home village in Kenya. 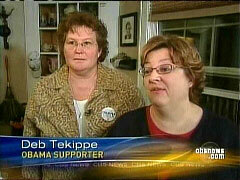 Alma [sic] is Obama's half-sister. MAYA SOETORO-NG: I mean, I did have somebody come in and say, ooh. I'm going to shake the hand of the lady who is mentioned by of the president of the United States of America. SCIUTTO: We thought the excitement was embodied by this e-mail received in our Rome bureau from a Italian woman. It said "Dear friends, your country has renewed faith that all is possible. Welcome back American dream." It's that kind of emotion around the world now. Robin? ROBERTS: It is that kind of emotion, Jim. Thank you so much.